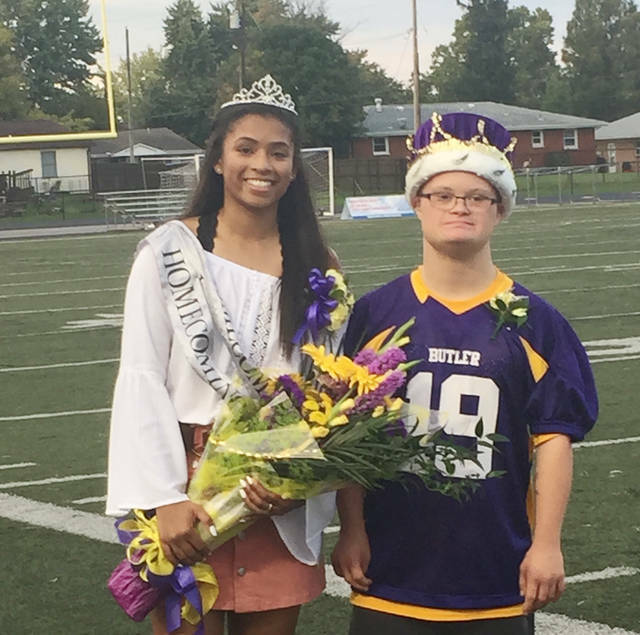 Tyree Fletcher was named Butler’s 2018 Homecoming Queen and Andy Thomas was named the 2018 Powder Puff Queen prior to the Aviators’ game versus Troy on Friday, Oct. 5. Ryan Martin (25) looks for running room verus Troy. Connor Hendricks looks for running room after a pass reception versus Troy. Butler quarterback Mason Motter looks to the sideline for signals during the Aviators’ loss to Troy on Friday. 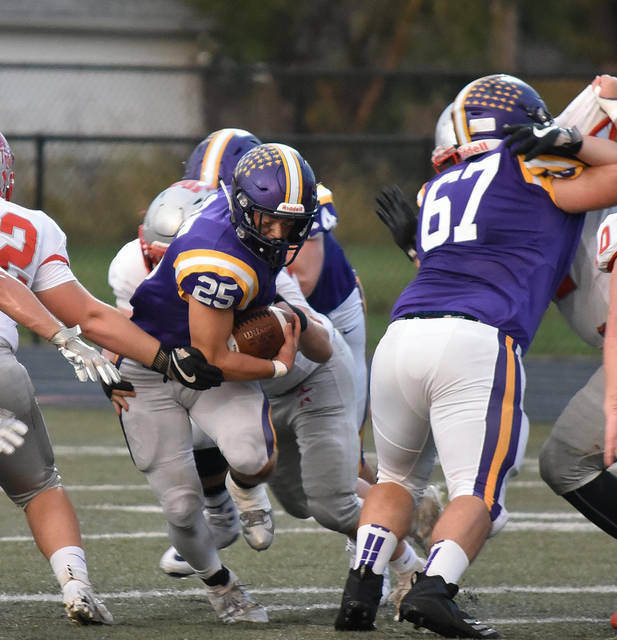 VANDALIA — Special teams play has been a problem all season for the Aviators and head coach John Puckett is searching for answers. On Friday, Troy’s Blake Burton came up big on two special teams plays that made the visitors’ winning margin appear much bigger than the play on the field indicated. The Troy football team’s senior linebacker blocked one punt and force a fumble on another to power the Trojans to a 25-0 win over Butler Friday. 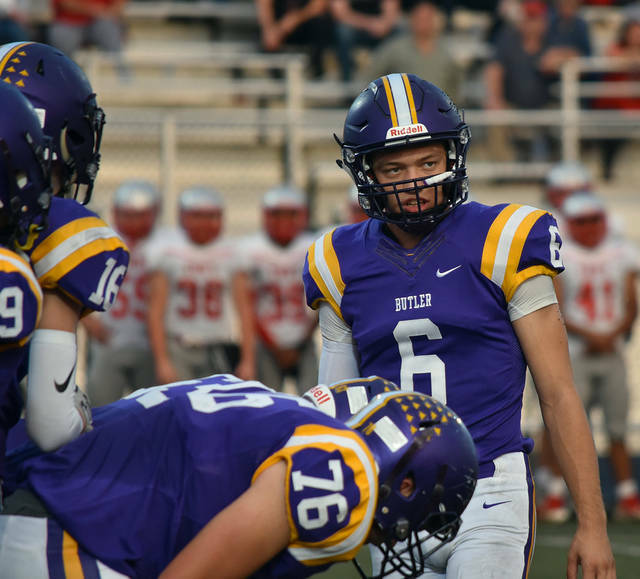 With the win, Troy improved to 6-1 (2-0 in the Greater Western Ohio Conference North Division), while Butler fell to 4-3 (1-1 in the GWOC North). After Troy’s defense forced a three-and-out on the Aviator’s opening drive, Trojan linebacker Blake Burton broke though the Butler line and blocked the punt, knocking it back into the end zone, where Raskay fell on it to put the Trojans up 6-0. Later in the game, with Troy leading 19-0, the Aviators again had to punt from their own end zone, thanks in part to the Troy defense, which was lights out all evening. This time Burton was about to tackle the Butler punter, who fumbled the ball and fell on it at the Aviator 3-yard line. Three plays later, Jaydon Culp-Bishop bulled his way in from a yard out to put the Trojans up 25-0. Troy’s offense struggled to move the ball early in the game, going three-and-out on its first two drives. On Troy’s third drive, however, the Trojans finally got the ball rolling. Tight end Spencer Klopfenstein ignited the drive when caught a pass from quarterback Brayden Siler and rumbled 53 yards to the Butler 17. Two plays later, Culp-Bishop bulled his way in from 12 yards out, putting the Trojans up 13-0. That was just the warm-up act for Run JCB, however. After the Troy defense forced yet another three-and-out, Butler punted and pinned the Trojans at their own 3. On the first play from scrimmage, Culp-Bishop gave Troy some breathing room with a 9-yard run. On the very next play, he took the ball up the middle, cut outside, broke a tackle and outran the Aviator defense 88 yards for a touchdown to put the Trojans up 18-0. 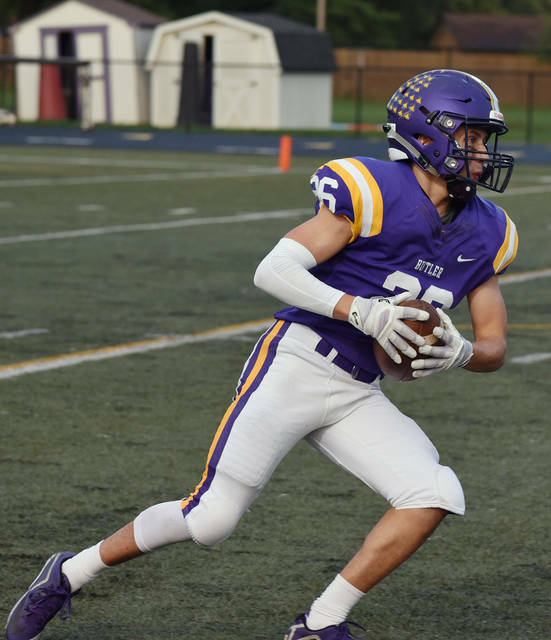 Key injuries have the Aviator coaching staff searching for answers – especially among underclassmen. The shorthanded Aviators will host Piqua (5-2, 2-0) in Week 8, a team looking for playoff points just like Butler. Contact David Fong at dfong@troydailynews.com; follow him on Twitter @thefong.